FC Barcelona were held to a 1-1 draw by Hércules at the Estadio José Rico Pérez in the first leg of the Copa del Rey Round of 32 on Wednesday night. 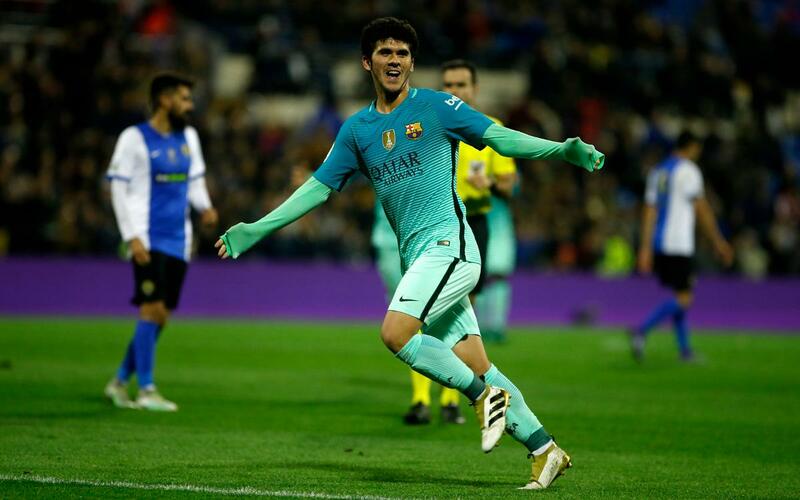 The Division 2B Group III side took a shock lead over the cup holders before debutant Carles Aleña’s fine long-distance strike gave Barça the equaliser, which gives the Catalans a slight advantage going into the second leg on December 21 at Camp Nou. Barça’s first effort on goal came after ten minutes when Paco Alcácer struck a free kick goalward that needed to be saved by Ivan Buiges in the Hércules and while many would have expected that to spell the start of a flurry of chances for the visitors, it was not to be the case. Luis Enrique’s men dominated possession but failed to create much else in the opening period against a Hércules side who set out to absorb pressure in their own third. Arguably the closest Barça came to scoring was when Denis Suárez’s outswinging free-kick was met by Borja López, but the unmarked defender headed well over the bar, with the cross perhaps slightly too high for him. Just as in the first half, the second period started with a testing free-kick on goal, but this time it was for Hercules. Borja’s jinking provoked a fould on the edge of the box, which allowed Gaspar to have a go with his sweet left-foot but while his effort went around the wall, it was a routine stop for Jasper Cillessen. Minutes later however, the home side took a shock lead. A teasing inswinging cross from the left-hand eluded Barça centre-backs Samuel Umtiti and Borja, and striker David Mainz was on hand to prod home for a shock 1-0 lead. But just as was the case during the 1-1 league draw at Real Sociedad on Sunday, it only took six minutes for Barça to respond at the start of the second half. With seemingly very little on, Rafinha laid the ball off to Aleña who then released a thunderbolt from around 30 yards out which nestled in the bottom corner. The 18-year-old, along with Alex Carbonell and Borja are making their official debuts for the club. A floated free-kick found André Gomes in space but the Portuguese midfielder was unable to generate power on the header, and so was comfortably collected by Ivan Buiges. Young Marc Cardona, another youngster making his debut after coming off the bench, almost made an instant impact after volleyed goalwards with almost his first touch but the strike was well saved by the keeper. Hércules held firm until the very end to earn a memorable point as Barça simply could not find another way past the resilient hosts. Barça will be looking for a more commanding display in front of their own supporters in the second leg, which will be played on Wednesday 21 December, in order to advance to the last 16. For now however, the Copa del Rey will slip to the back of their minds, as the small matter of El Clásico on Saturday takes centre stage.